Snag simple toddler lunch ideas for daycare or home with your 1 or 2 year old! 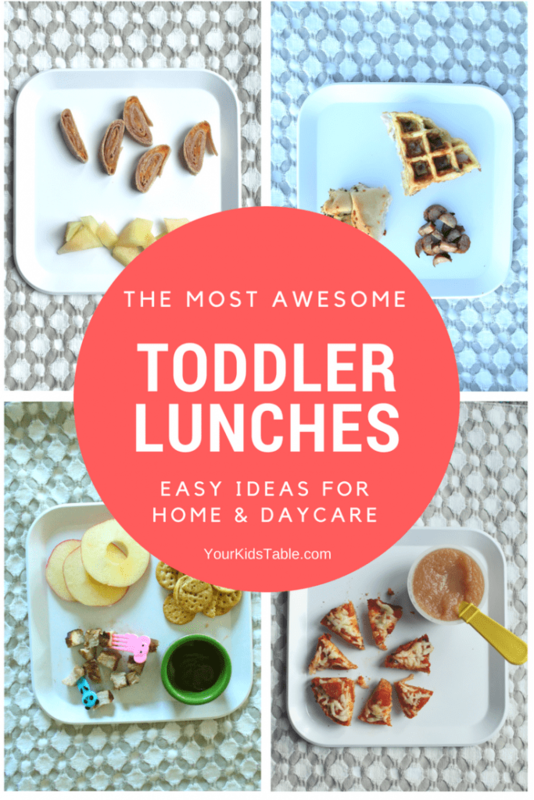 Quick, easy, and healthy toddler lunches included in this incredible list! I hate the moment when I realize it’s time to feed my kids lunch and I haven’t thought about what I’m going to feed them. Of course, as soon as I have this realization, a child hanging on my leg suddenly appears, whining and/or crying that they’re hungry. Now it’s decision time and I need to act fast, as I can already feel my heart beating faster as the whining increases. 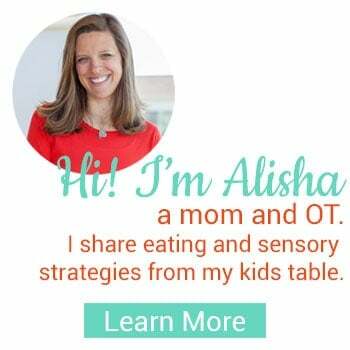 If I’m not careful, they end up eating the same foods over and over again, and while that’s okay from time to time, as an OT, I know that it’s way better for them to be exposed to more variety. To avoid that dreadful thought of “what the heck am I going to feed you today,” I often keep a list of ideas on my fridge that I can look at in the morning, whether I’m packing the lunch in advance or have the ability to make a hot lunch in real time. 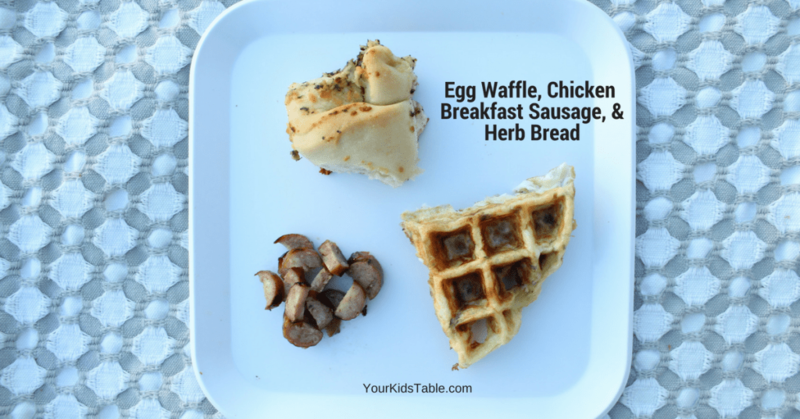 This makes a huge difference in exposing my kids to a wide variety of foods, textures, and tastes. It also helps prevent them from getting into the rut of only eating the same foods, and heading down the dreaded picky eating path. If you’ve been around here long, you know it’s a path I’m all too familiar with. 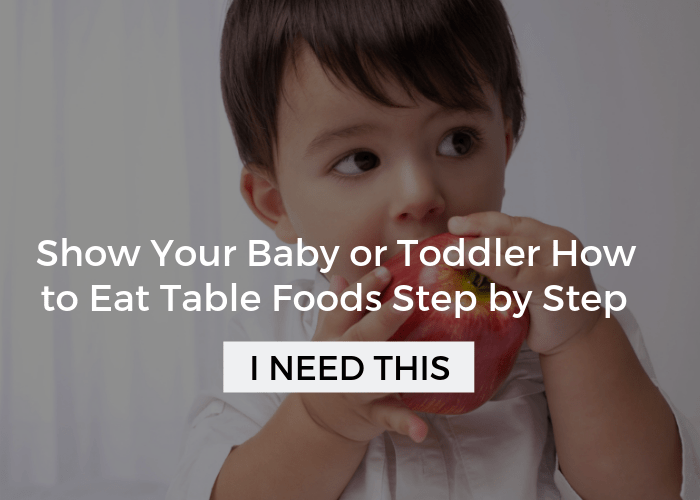 My youngest child just turned three and is just exiting the toddler stage, but a lot of our foods still need to be toddler friendly for him. I’m sharing a list of toddler lunch ideas (1 and 2 year olds) that work for kids of all ages (3 years and up), which is perfect for families with more than one child too! My hope is that this list inspires you with some new kid and toddler lunch ideas. And, I’ve got some special picks for toddler lunches for daycare (check out my favorite toddler lunch box, too! 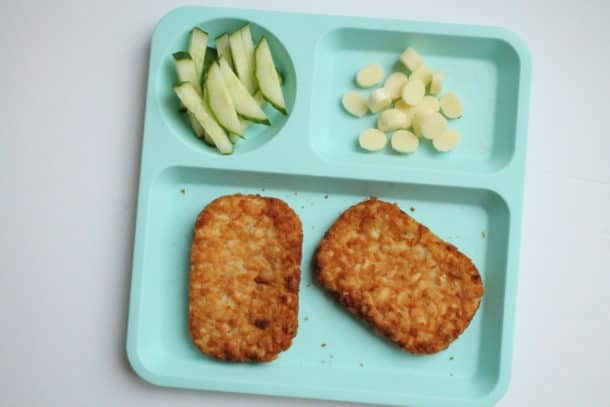 ), healthy toddler lunches, and classic easy toddler lunches. When I’m thinking of toddler lunch ideas, I’m first and foremost thinking of safety. Young toddlers can’t chew as well as older kids and some foods like popcorn and whole hot dogs are choking hazards. Besides safety, I’m also thinking about foods that are simple, wholesome, and, if possible, a little fun. 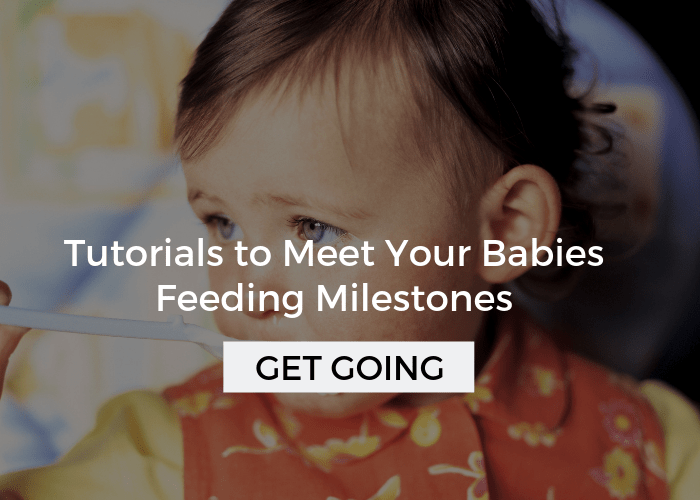 For toddlers, everything is fun and eating doesn’t have to be an exception. Not to mention these fun ideas are really motivating for older kids too! 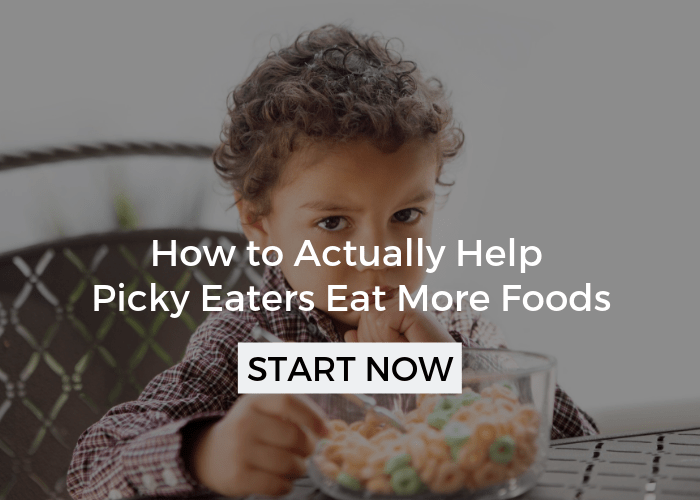 It’s also important to keep in mind that foods are easy to pick up or scoop with a spoon or fork (these ones are perfect for little toddler hands that are just learning), and that their portion size isn’t too big. As parents, we tend to put way too much on their plate. Head to Toddler Portion Sizes to learn how much they actually need to eat. Sometimes I use little picks for their food, as you’ll see in some of the pictures. This brings in that fun element, but they’re also easier for toddlers to use! Get creative, lots of different meats, fish, or beans can be added to the inside and heated a minute or two in a pan, the oven, or microwave. I mix leftover shredded or canned chicken with some plain yogurt and mayo, and then season. Cream cheese, mashed avocado, and diced tomatoes inside a pita (cut into triangles). I took leftover pumpkin french toast from breakfast on the weekend and cut it into strips, big hit! Easily made in advance and pulled out of the freezer. Choose a filling that has something your toddler likes and add a new veggie that you’ve minced. Obviously packing a lunch presents some more challenges, especially when you don’t have the option to have your child’s lunch heated. All of these toddler lunch ideas for daycare will be ready to go when your child opens their box. 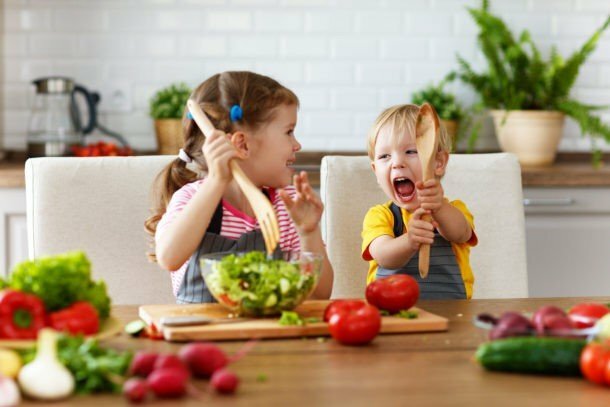 Quick Tip: Pack 3-5 different foods for your child and make sure you give enough of each. This is the exception to the toddler portion sizes, its okay to “over-pack” a little. It’s hard to know when they’ll be ravenous! If you’re toddler isn’t eating well at daycare, check out How to Pack a Lunch Your Child Will Eat. In the picture above I melted for 20 seconds in the microwave and then sliced into circles. If your child likes crispier foods, you can pan fry the slices after you cut them or bake it in the oven before packing. Cold or room temperature pasta makes a packed lunch for daycare really easy. Think about using those leftovers too! Bacon still tastes pretty good at room temperature and not much different even when it’s cold! Quartered peanut butter and banana sandwich, yogurt tube, and thinly sliced apples. If you’re making for a toddler, make sure the peanut butter isn’t too thick or it could be a choking hazard. Toasting the bread helps too! 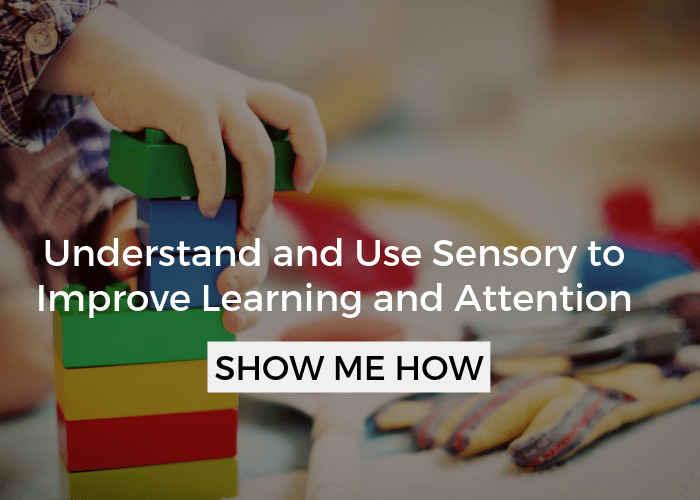 It can be hard for toddlers to “unpack” and organize their lunch out of a larger bag. Opening lots of little containers can also be challenging, when there’s helpful hands nearby I really like the Bento Box for kids and toddler’s lunches. The built in compartments keep all of their different food organized and separate. Plus, you aren’t washing lots of different containers. If you’re looking for a more environmentally friendly and sustainable toddler lunch box, as well as a bigger investment, we love and have a Planet Box! Healthy means different things to different people. For me, healthy means a meal with whole foods that includes variety! Simply make a scrambled egg batter and pour into a waffle iron! Add some diced leftover veggies before pouring in. Leftover or fresh rice with whatever beans you have on hand gets the job done! 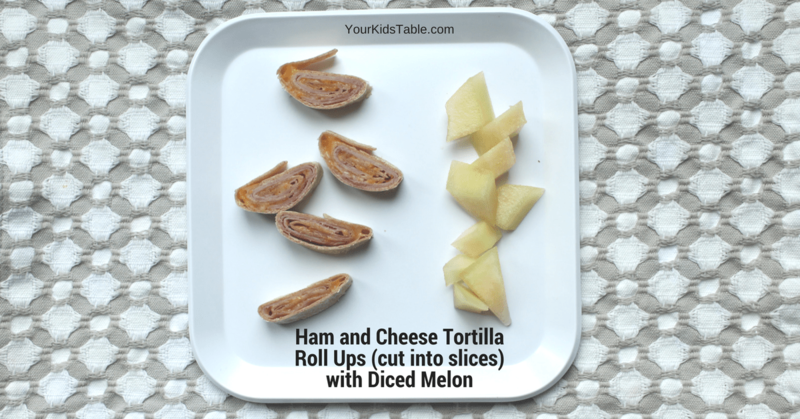 Either assemble like sandwiches or allow your child to dip and put foods together on their own. I’m talking REALLY easy, like you only have a few minutes to pull this together! When I’m in a pinch, the first thing I check is if we have any leftovers. I try not to serve them the very next day after dinner, but instead a day or two later. I see a huge difference in toddlers and children that are willing to eat them with that little break. 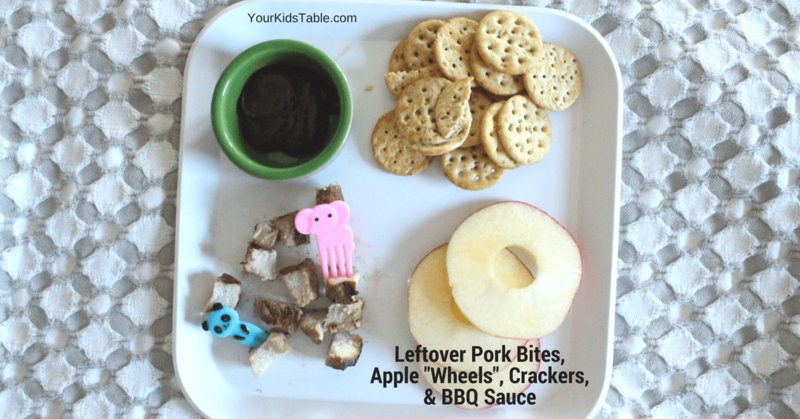 If I don’t have any leftovers, then I also go with classic toddler lunch ideas in a pinch. 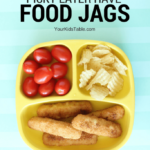 I even put these classic toddler lunches on my list because half the time I forget about them! For many of us, it’s common to have left over chicken breasts or pork chops from a dinner in the fridge. I like to cut them into cubes, season them up a little, and quickly toss them in a skillet to heat them up. It’s a perfect leftover toddler lunch! I always have a couple of cans of Trader Joe’s variety just in case. Fair warning this is a messy meal, but don’t let that deter you. Read more in Why Toddlers Should Get Messy Eating. Kids that refuse peas cooked will often eat them frozen. Sounds weird but it might work, and its super easy! 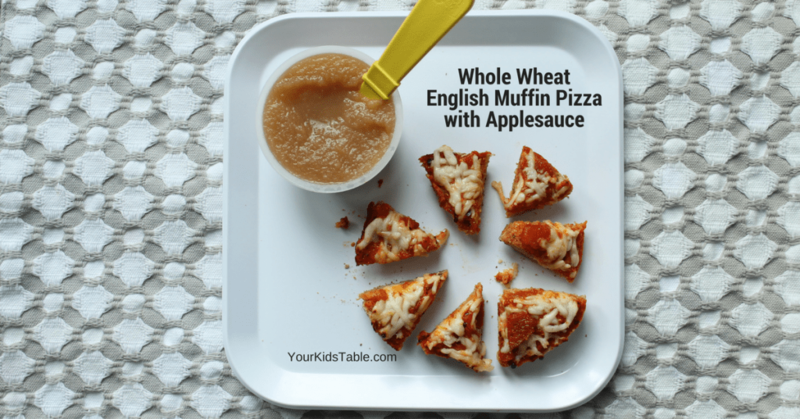 Want More Toddler Meal Ideas? We can never have too many ideas! How about breakfast and dinner too? Grab The Toddler Food and Meal Ideas Printable here. When you sign up with your email, I’ll send it right to your inbox. Hang it up on your fridge or save it on your phone to get inspired whenever you need to! 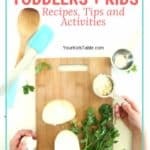 Click Here to Get the Free Toddler Meal Ideas Printable! Stick this on your food ideas or baby board so you can find it again when you need some more ideas!